Tamales in my family, are always what can be only be referred to as ‘bien dados,’ a phrase with no literal translation but that can only mean large, chunky, well proportioned, will not leave you hungry. If you have to eat more than two or three of these tamales, they are decidedly not bien dados. Making corn tamales with American corn is a much different experience than when using Mexican corn, requiring more time and work. The corn is smaller, sweeter and filled with moisture. The husks are usually useless, and there is usually no point in reserving them to wrap the tamales. Usually. Heirloom corn grown in Saratoga County, New York. 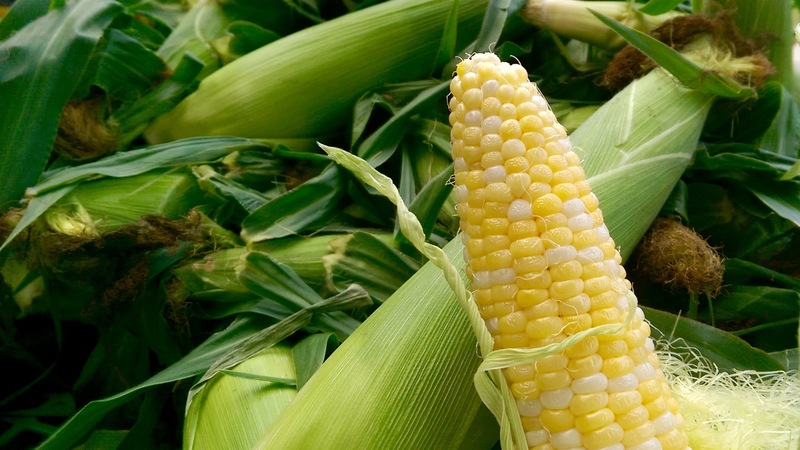 Thankfully, heirloom varieties of American corn haven’t forgotten how to be proper corn. They’re still slightly too sweet and too wet, but occasionally, with careful cutting rather than forceful pulling, the husks will still be large enough to once again wrap the corn it originally contained. To deal with the excess of moisture in the corn, plan ahead and allow the corn to drain for a few hours and press out any excess moisture. Mixing in a bit of maseca (or corn masa flour) will absorb any remaining moisture and help bind the ground corn. This is a recipe for which I do not recommend under any circumstances using frozen corn, as it would simply have too much moisture to it and would be a wasted effort. If the corn has husks large enough to use as wrappers for the tamales, approximately 6-7″ wide and long, cut all the way around the base of the ear with a sharp and heavy knife. Peel off the husks, stacking and pressing them flat to ease working with them. Wrap the loosely in plastic and refrigerate until ready to use. If the husks are not usable, tear away. The silk of the corn can be reserved and dried if desired. Consumed as tea, corn silk has many health benefits. Working over a large shallow container lined with a clean kitchen towel, hold the corn vertically and carefully cut away the grains. Cut deep into the corn, even cutting into the cob itself, which holds a lot of flavor begging to be taken advantage of. Depending on the size, each ear of corn should produce approximately one to one and a half cups of cut grain. Use a food processor to coarsely grind the corn, leaving some grains almost whole for added texture. Strain corn for several hour, or up to overnight, placing a heavy dish on the surface to help any liquid come out of the grain. The result milky liquid can turn sour very quickly, and is frankly not good for much. While corn is draining, roast the peppers under the broiler or on a grill. The skin on anaheims is very thin and can burn quickly. Sweat the peppers in a covered container at room temperature until cool enough to handle. Remove the skin, stem and seeds from the peppers. Cut into 1/4″ strips, or rajas. Crumble the cheese into small chunks, or cut into 1/4″ by 2″ long pieces. Whip room temperature butter until fluffy, mixing in the baking powder. Mix in the drained corn, seasoning with kosher salt to taste, and combining well. Slowly add in the maseca as needed, until the mixture starts to just form clumps. 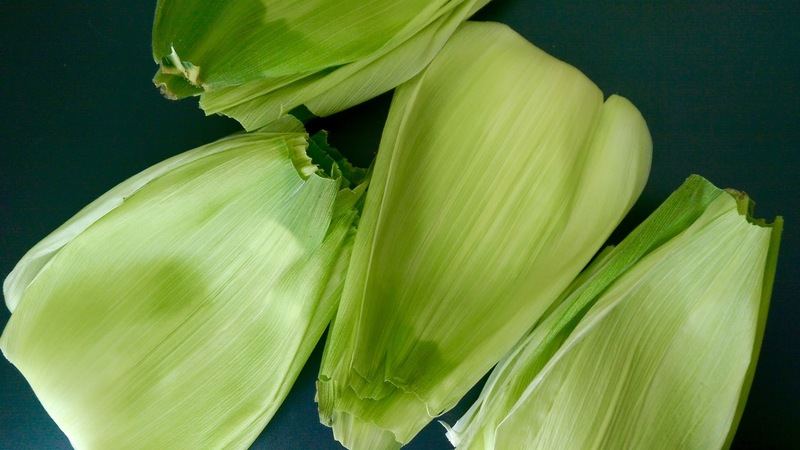 If using fresh corn husks, rinse well with hot water. If using dried husks, rinse well under running water and soak in boiling hot water for approximately 15-20 minutes, or until soft and pliable. Drain before using. To assemble the tamales, hold a corn husk at the widest part. Spread an approximately 1/4″ thick layer of the corn mixture on the husk, measuring around 7″ wide by 4″ high. Place cheese crumbles and pepper strips in the center of the tamal and fold to enclose them. It is usually necessary to use more than one husk to completely enclose the tamal. 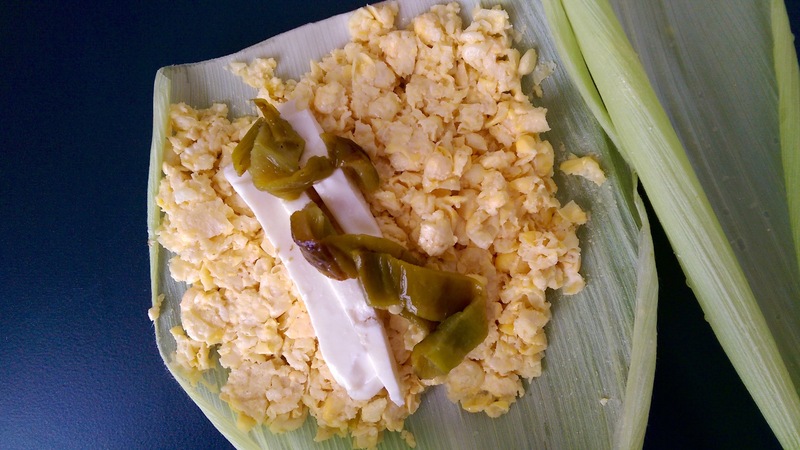 Corn tamal with chile verde rajas and queso fresco. Place a steamer basket inside a deep pot just big enough to hold the tamales and line with a layer of corn husks. Be sure there are at least 2″ of room to fill with water between the pot and the steamer basket. The tamales will cook best if standing vertically in the pot without too much overlap between them so they cook evenly. Cover the top of the tamales with more corn husks and cover the pot. Cook over medium heat for approximately 30 to 40 minutes. Be very sure to not run out of water in the pot. Scorched corn husks absorb an acrid burnt smell and taste. Not being vigilant about your water level means all the effort in making the tamales will be completely wasted. Keep a kettle of warm water handy in case it is necessary to add more water. Allow the tamales to cool for ten minutes before eating. If you can wait that long.